Published on December 10, 2016 by Martyn. Be the first to comment! 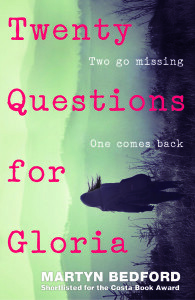 Lovely to hear that Twenty Questions for Gloria has been shortlisted for a prize at a school in South Wales. It’s up against Tom Anderson’s Luca, Son of the Morning and Sofi Croft’s Eidolon in the 14+ category of the book awards at Ysgol Bae Baglan, in Port Talbot – a brand new school which opened in September and has around 1100 secondary-age students. I have fond memories of that part of the world, having been a journalist on the South Wales Echo in the mid-1980s and winning the Neath-Port Talbot Bay Book Award, for Flip, in 2011.